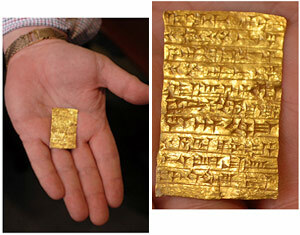 An Ancient gold tablet, excavated from Northern Iraq in 1913. A German Museum has lost an action against Riven Flamenbaum to recover this ancient gold tablet that may be worth as much as $10 million. You can read the opinion here, in Matter of Flamenbaum, File No. 328416. The tablet has quite a history. It was unearthed in 1913 in Ashur, present day Qual’at Serouat by German archaeologists. It was bound for a German museum, but World War I forced the ship carrying it to Portugal, where the object was stored until 1926. In 1934 the tablet was put on display in the Vorderasiatisches Museum. At the end of the war, in 1945 it was discovered the tablet was missing, perhaps looted by Soviet troops. It is at this point that Flamenbaum—a survivor of Auschwitz—encountered the tablet, which he may have purchased on the streets of post-war Berlin for some cigarettes. He took the tablet with him when he emigrated to New York in 1949. He had no inkling of the object’s value, after it had been apparently appraised for as little as $100 at one point. The family contacted the Museum in 2006 after Flamenbaum’s death, and the museum brought suit to recover the tablet. In New York, this action was within the statute of limitations because the period does not begin to run until an original owner demands an object and is refused—which in this case was 2006. However Surrogate John Riordan held that the museum had waited too long to bring this claim under the doctrine of laches—an equitable doctrine which essentially posits that it wouldn’t be fair to allow the claimant to regain title. The court held the lack of any real effort by the museum to seek the return of the tablet was unreasonable. Surrogate Riordan placed a good deal of weight on an apparent 1954 report of the object’s location. But the opinion does not offer any details of this report. The Museum had not really had possession of the tablet for very long, and had not made extensive efforts to contact post-war authorities or stolen art registries. But of course it is not necessarily clear if those efforts would have even been successful. Moreover, in some cases publicizing a theft in this way seems to run counter to the policy which underpins New York’s Demand and Refusal rule. If you publicize the theft, that recovery may make diligence less likely, and might encourage other possessors of objects with questionable histories to move objects to other jurisdictions. One wonder perhaps how much the underlying equities were a factor in the decision as well, with a seemingly-innocent Holocaust survivor acquiring the small tablet, without knowing its true value. Vesselin Mitev, German Museum Loses Attempt to Reclaim Artifact From Estate, New York Law Journal, April 6, 2010. Next Next post: Student Note on "Cultural Pragmatism"